Olive Leaf is naturally extracted using only the finest quality leaves from mature trees grown in the prestine environment of Andalusia, Spain. Our Standardized True Spectrum extract provides active levels of oleuropein, concentrated in the balanced ratio nature intended, without isolating, fractionizing or using toxic solvents, harsh chemicals or gases. 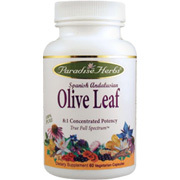 Clinically, Olive Leaf extract has been used for a relatively short time. Health professionals first began using it early in 1995 when it first became available. Historically and traditionally, people have long used olive leaf for its medicinal properties in treating a wide range of disorders. The robust bitter substance is called oleuropein (oh-lee-or-oh-pin) and is the key healing agent. 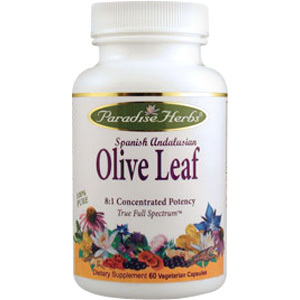 Olive leaf has been beneficial for conditions caused by or associated with a virus, retrovirus, bacterium or protozoan. Among such conditions are influenza, candida, common cold, meningitis, Epstein-Barr, encephalitis, herpes 1 and 2, human herpes virus 6 and 7, shingles, HIV/ARC/AIDS, chronic fatigue, hepatitis B, pneumonia, tuberculosis, gonorrhea, malaria, dengue, bacteremia, sever diarrhea, blood poisoning; dental, ear, urinary and surgical infections; treatment of fevers, digestive and diuretic effects; relief of low blood sugar and as a natural wide spectrum antibiotic. Research has found it to inhibit oxidation of LDL "bad" cholesterol involved in heart and arterial disease. Many people who lead stressful lives or who are particularly susceptible to colds and viruses may benefit from long-term use of Olive leaf. Olive leaf is currently being used with a great success to help reduce high blood pressure and improve cardiovascular health and capillary integrity. Research indicates that doses higher than recommended are unlikely to produce toxic or other adverse side effects. Spanish Andalusia Olive Leaf - is shipped in a discrete, unmarked package. Orders are processed immediately and usually take about 3 to 5 working days to be received. We do ask that you try it for 2 to 3 weeks to feel the full effects. Any information received is used only for order processing and shipping purposes. Your information, such as e-mail address, will never be disclosed to a third party.